i had just endured an 8-hour journey, most of which i spent awake, with my eyes closed, but my ears fully aware of everything. i felt every turn, each stop, all the bumps on the road, which ended very early in the morning in daet. so when i was asked if i would be interested in trying out the surf, i politely declined. i have a short, yet tumultuous history with water, and my past experiences, though few, have served to sour my relationship with it. i had nearly drowned as a child, and although i was born near water, it never endeared itself to me. so although the pacific ocean gently rolled into the long, black stretch of bagasbas beach, i was not in the mood to try out something new. the sky was heavy with uncertainty, and a drizzle late in the morning made for a very bleak outlook on this suddenly-hatched weekend. but i had exhausted my curiosity after just a few hours: i had taken pictures of local youth throwing their teardrop shaped boards on the fringes of the beach, catching the sea as it retreated. i had looked without interest at the wall erected by power-up, and decided that i wasn't keen on playing volleyball. 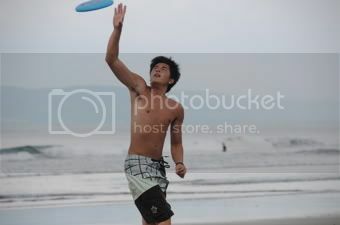 neither was i attracted to ultimate frisbee beyond being a spectator, and i knew i would only expose myself to humiliation if i even dared try beach football. skimboarding was out of the question as well, and i wasn't too keen about taking my shirt off when the beach was populated with sculptured abs. the edges of the beach frothed with activity for the bagasbas summer surf, hoping to catch the last dregs of a season that had more rain than sun. so despite my absolute lack of attraction to what seemed to me a novel and poseur sport, i decided to just dip my fingers, as it were, into the thing just to be able to say that i did it. at least once in my life. i put on my rash guard, tightened my board shorts, and headed to the where the boards were placed when they called out my name. i had deliberately chosen the red board. it could be seen from very far away, and figured that it would at least make for good photos. without much hesitation, i handed my camera to a stranger, who turned out to be owen andrade -- no less the father of surfing in bagasbas and the figurehead of the volunteer lifeguard brigade. john, aged 19, volunteered to teach me. it was a surf clinic, after all. 10 minutes into his lecture, my vocabulary already grew with at least 5 surfing terms, dude or surf's up not being among them. we headed to the water, he carrying my big, red board. i had to ask: why start with a long board when it's less maneuverable than the short board? owen had an immediate, if not ready answer: when we were kids, didn't they teach us to write with a big pencil? i attached the board to my left ankle. i was goofy-footed, john said. so we proceeded to the water, and the first order of business was balancing myself on the board. it wasn't as easy as i thought. i always tilted to one side, but john patiently assisted me. then wave after wave came. i was pushed, and i was very focused on the balance. although i began the day without interest, i tackled the challenge with a method. the goal, of course, was to manage to stand on the board, but it wasn't the first thing i wanted to do. i had to get there, one step at a time. 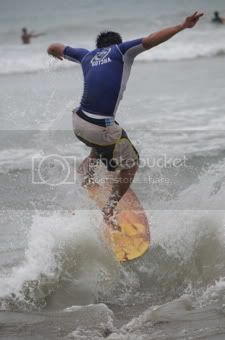 after i managed to balance the surf, i next decided to kneel, with my body parallel to the board. did it on my second try. on the third, i put my right foot forward, but with my hands still holding on to the edges of the board. i did it again. that wasn't too hard i thought. on the next few tries, i was washed out by a multiple. i held my breath for many seconds because the short surf's white water crashed over me. see what i mean about surfing lingo? my next goal was to keep my left knee on the board, but my hands off the board. that was easy enough. and now comes the hard part: standing on the board. i kept forgetting john's instruction to keep both knees bent, to lower my center of gravity, and t keep both feet as far apart as possible. for the next few surfs, i kept falling into the water, a few times getting tumbled in with my board. one time or another, another surfer nearly crashed her board on me. this probably what scared me the most about surfing. i had observed better surfers at cloud 9 in siargao in the past, and i always worried whether freak accidents have resulted in open skulls. boards have fins underneath, which aren't very sharp, but at certain speeds, can probably cause serious injury. after a series of falls, due mainly to my inability to balance, or often due to the wave's strength and size, i was nearing frustration. "makatayo lang ako okay na tayo," i told john. i was so wrong, and he was in for a huge surprise. when i finally managed to stand longer than 5 seconds, i heard wild cheering all the way from daet! actually, it was just me, john, and a few other curious surfers who found my attempts at surfing funny. but i managed to stand. i was actually there, pushed to the shore by the surf, on a board about 9 feet in length! so i suddenly broke my promise and decided to surf some more. without me expecting it, i was immediately hooked, just because i managed to stand, just because i rode a modest surf, which was nothing much really but the bubbles of a receding wave. but who cares? i managed to do something which was initially beyond me, and actually liked it. only 45 minutes was alloted for the lesson, but due to the collusion of certain events, including the wireless mic running out of battery, the announcement to return the board never came, and i only decided to end the ride because i feared john might be bored to death (he denied he was) watching a newbie getting overly excited at the ability to stand up and balance. also, my body was beginning to bruise from getting stirred too much in the water. so i returned to the beach, a huge smile of accomplishment pasted on my face, and still astonished for not having given surfing the credit that it deserved. i had passed up on the chance to surf many times in the past. while i didn't necessarily regret my belated discovery, i certainly was amazed that i would like it with such feverish excitement. i was humbled by the experience, no doubt about it, but i've never stood up so many times from having fallen an equal number of times. looked forward to the following day! however, before i could even spread the word about my newly discovered passion, i was not unwillingly baptized into the world of wild surfing culture. 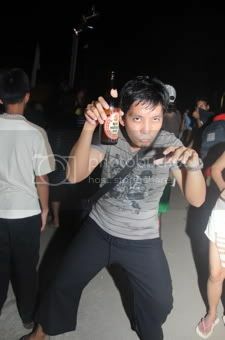 that evening, still dreamy from lack of sleep, we proceeded to a party by the beach. a show band tirelessly performed before a stoic crowd. they were unresponsive, the crowd, almost appearing deaf, if not numb. it may have been the band's talent, which was not a lot, but i couldn't say with certainty that they had none. of course, the surfers and skimboarders weren't necessarily interested in the music of fergie and nicole, nor that of sean kingston. because when coffee break island began to perform, the space in front of the stage began to fill with people holding stale, lukewarm san miguel pale pilsens. i was handed a bottle but balked at its bitter flavor. when i found maui, nicole's brother, we went to a nearby store and got ourselves some red horses. the party itself was all-consuming. i'm not such a big fan of reggae either, and the sound was broken, but i've been an advocate of: when no one knows who you are, go crazy! of course this has been disproven many times: someone almost always knows me, and it has happened while i danced with wild abandon outside mcdonald's during the masskara festival street party and while i went over the fence in boracay: some person or other has approached me to say: hey, i know you. but anyway, it's not like i was being more controversial than i usually am, but then again, my actions were generally unbecoming of my professional stature. but to hell with it, right? so when smirnoff vodka came my way, i didn't refuse. when a group of strangers handed me a water bottle with suspect liquid inside, i didn't decline. even when the grand matador and coke was about to go somewhere else, i specifically asked for it. haha. what an alcoholic! 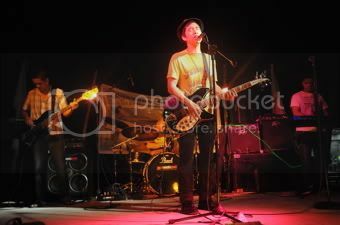 i was so happy that night, and although louella and i decided to go home at 10pm, we were still partying till after 11pm, when coffee break island sang its last song and the show band took over. i volunteered to buy a case of beer for a group of complete strangers. i'm like that when i'm drunk with a fantastic realization: and of many things as well, not just surfing, not just of surfers, and not just of daet's many delights. but like a couple of cinderellas, louella and i had to go home at midnight. we were going to look for a tricycle, but our new friends volunteered to bring us home. i was too drunk to realize the danger of the situation: sam's scooter had no headlight. i didn't care, and i jumped behind him without much care. after a few minutes on the road, without the ability to process anything, we were on the road. we'd actually lost balance and skidded. it was my second scooter-related accident in 7 months! i stood up, and the first thing i checked was my camera. i didn't feel like i was injured; nothing was in pain. i was okay. sam, my pilot, also said he was fine. we proceeded to canimog, and only there realized that sam had some scratches. i had small scratches too on my toes. otherwise, i was fine, and i fell asleep immediately. that morning, i woke up with my head split in two. louella and i were running late. we had arranged for a trip to manukan island with sam and his friends. when we reached bagasbas beach, it had more people than i could count. i was looking for paracetamol when i chanced on a reader of my blog. then we proceeded to the fish port: a shallow body of water that flushes out into the philippine sea through a small break along the beach, and took the same boat that's on the SEAir ad to manukan island, which is about 30 minutes away, and is nearer the pacific than the rest of camarines norte. there are several islands off the province, and i've been to at least 2 others in an earlier trip. that morning, i realized that other than small scratches on his legs, sam's chin had absorbed much of the fall the previous night: it was black, blue, red, and swollen. poor kid. manukan is a small dot halfway between daet and another mythical place: calaguas island. 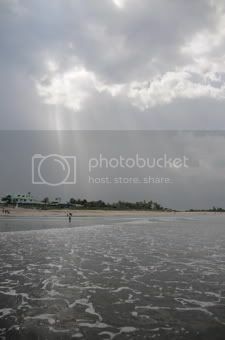 it is surrounded by a nice, cream-colored beach. one side, the one directly pointing to the pacific, is fringed by flat rock, which looked like layers of cracked, rectangular biscuits. 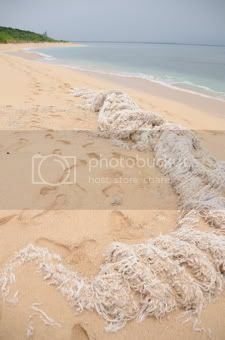 a lump of white rope, the diameter of which is the size of my leg, is coiled and deposited on the other end, one can imagine the great forces of nature that brought it there. 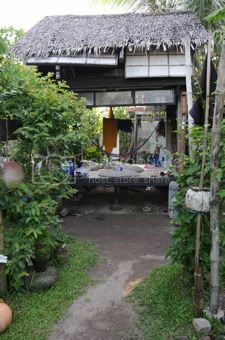 we spent half a day there, and i began imagining about my return, although i said the same about apuao as well. we returned to bagasbas beach and we had lunch at cantina ni angel. the food wasn't divine, and we were asked to stay outside because we were wet and would track sand into the dining area. why build a restaurant in front of the beach when you turn away customers with sand on their slippers? during lunch, we found out that just that morning, a drunken tourist in jeans was fished out a difficult back current. a little later, after another hour of surfing which i terribly enjoyed regardless of how it made me look silly, and which imbued me with more than enough confidence and resolve to pursue the sport, and which lasted till i burned my nose, i had a chat with owen and he regaled me with stories about how surfing began in daet, and how his passion for the sport is fueled more by his desire to save lives. bagasbas has an evil ring about it, it almost sounds like bad water. i found in him a potentially good story i'd like to write in the future. but alas, it was time to return to manila. the trip home would be a little shorter, which gave me less time to contemplate the past weekend. i had many realizations, and i didn't just try a sport, i was impacted, rather profoundly, by a totally new culture, not too different or far apart from my own, but certainly something that gives me and my mountains a different dimension. i will confess: i was stoked, and i cannot wait for my next surfing trip. do you want to join me? beautiful entry. great coverage of the event. 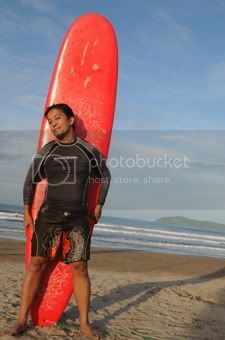 annual ba 'tong summer surf? last november, meh similar event sa san juan, LU. 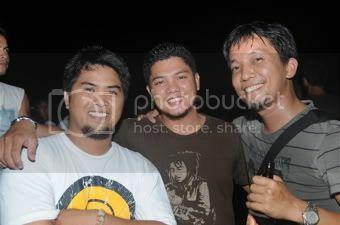 i dunno though if its annual -- but, by the looks of it, mukha naman. neat! thanks for the heads up! no problem. i doubt though whether you will have time for surfing, what with med school starting in 3 days. good luck! LoL. no, i seriously doubt i would make this a regular activity. one, there's med school in a few, and another, i also have an aversion to water. haha. it's something i want to try, though. now that i'm completely stoked, i'd take you to anywhere there's surf. it'll depend when you're coming, because the tides change depending on the season. from august till november, the pacific ocean's swells should be good enough. otherwise, let's seek out the south china sea. hehe. when's winter in slovenia, and when will we expect you? Alman, you really deserve our thanks for promoting our humble Province. 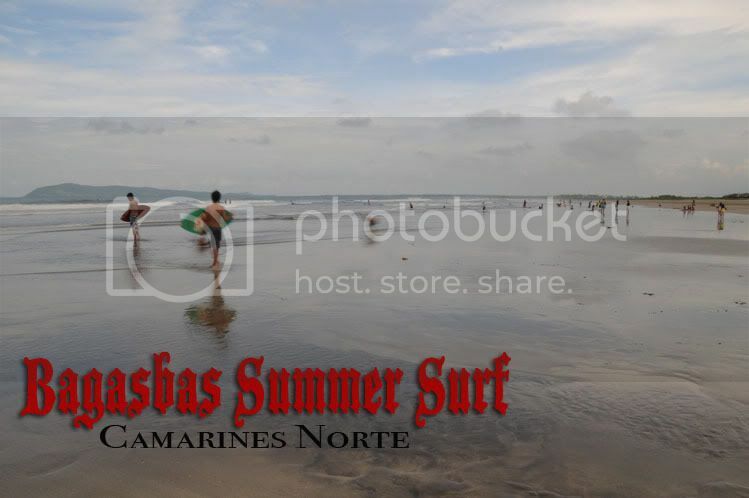 You might have noticed that Camarines Norte is an almost-left-behind Province. Despite that, I personally hold much hope for it to regain back its title as the land of gold and golden opportunities. Btw, I'm going home for a charity activity this weekend. We're going to distribute school supplies and things alike to students whose parents can't afford to buy them their needed materials. We're also planning to formally launch the said project next year, we'll name it "Trek for a Cause." Basically, we will try to integrate charity and fun. By that I mean our participants can enjoy a two-day nature hike while giving away educational materials to less fortunate students living within our chosen area. No formal plans yet, I mean that could still be altered. But we're already on our way of producing a proposal for it to materialize. I hope we can invite you to help. thanks adelle for your kind words, but really, i don't think i've done enough. after all, i'm just a traveler who talks a lot. there's so much more i'd like to do, not just for cam norte, but for other places. i'd like to be part of your trek for a cause. i've done similar things in the past. let me know, okay? good luck!